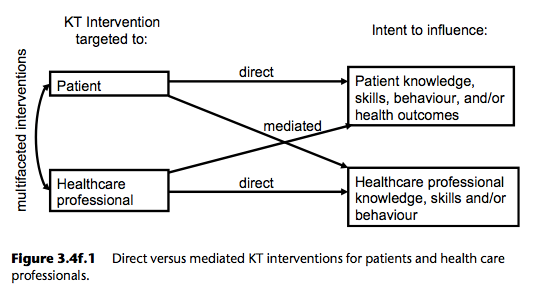 KT interventions should be tailored to the target audiences, one of which is patients. For patients, these interventions can be grouped into the following: a) interventions designed to directly influence patient outcomes, here termed “patient-direct”; or b) interventions provided to patients but aimed at mediating health professionals’ behaviours, here termed “patient-mediated”. Similarly, interventions targeting health professionals may influence their attitudes, knowledge, skills, and behaviour directly and may also mediate patients’ behaviours. All of these interventions are used to increase uptake of evidence in clinical practice and self-care. Health Literacy – supports a person to access, understand, evaluate, and communicate information as a way to promote, maintain, and improve health in a variety of settings across the life-course. Clinical Decision Making – focuses on supporting patient involvement in clinical decision making through patient decision aids, question prompts, health coaching, and training clinicians in communication skills. Self-care and self-management – interventions aimed at improving people’s practices in maintaining health and managing disease. Patient Safety – patient-directed interventions aimed at improving patient safety include information about choosing safe providers, getting involved in infection control, adhering to treatment, checking records and care processes, and reporting adverse events. Health Literacy – These interventions have the most consistent positive effects on knowledge and to a lesser extent on patients’ experience and use of health services. Health literacy interventions alone do not have consistent positive effects on behaviour and health outcomes. Written materials improve knowledge and recall, particularly if they are personalized. Combined written and oral information can improve patient experience and, sometimes, use of health services. Other formats, such as websites, improve user satisfaction and some studies report positive effects on self efficacy and health behaviour. Clinical Decision Making – The most consistent positive effect of these interventions is on knowledge followed by use of health services. Reviews that have examined question prompts and coaching found that these interventions have positive effects on patients’ knowledge, information recall, and participation in decision making. Their effects on satisfaction and treatment outcomes were inconsistent. Reviews of patient decision aids indicated that aids improve patients’ participation, increase knowledge of their treatment options and outcome probabilities, and improve agreement between patients’ values and subsequent treatment decisions. Self-Care or Self-Management – Overall, findings revealed improved knowledge, patient experience, health behaviour, and health outcomes. Although there were mixed effects across reviews, self-management programs improved knowledge, coping behaviour, adherence, self-efficacy, and symptom management. Programs that included skill development were more effective than those that provided information alone. In some cases, these interventions reduced health services use and cost, and enhanced quality of life. 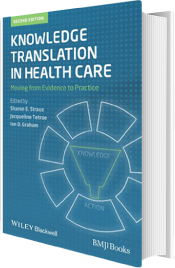 Patient Safety – Overall, safety KT interventions are effective in improving knowledge and patients’ experience and, to a lesser extent, use of services, health behaviour and health outcomes. The most effective strategy to optimize patients’ treatment adherence is to simplify dosing regimens. Education and information provision was necessary but not sufficient to improve adherence. Patient-mediated interventions are targeted at patients but aim to change health professionals’ behaviours through patient–provider interaction. We have expanded this definition to include any intervention targeting patients that aims to influence the uptake of evidence by health care professionals. According to this framework, other potential patient- mediated interventions include a) interventions for communication exchange between health care professionals and consumers; or b) interventions from the consumer.